Due to unprecedented demand, Intel’s latest Skylake processors with unlocked multiplier were significantly overpriced late last year. However, it would seem that more units are coming into retail as the popular Core i7-6700K and Core i5-6600K CPUs are becoming more readily available from multiple stores. As a result, actual retail prices of the chips have dropped in the U.S. retail in the recent weeks. Nonetheless, the most powerful Skylake-S is still listed above its suggested retail price. Intel’s top-of-the-range processor for mainstream enthusiasts (before they make the step up to HEDT platforms), the Core i7-6700K (four cores with Hyper-Threading, 4.0 GHz/4.20 GHz, 8 MB cache, Intel HD Graphics 530 core, unlocked multiplier), has an MSRP of $350 according to Intel’s ARK. About six weeks ago, this processor in the US cost more than $420 at some stores, and was frequently in and out of stock of the biggest retailers. However, this seems to be changing. Amazon currently (2/14) lists the Core i7-6700K for $365 but the chip is not in stock. 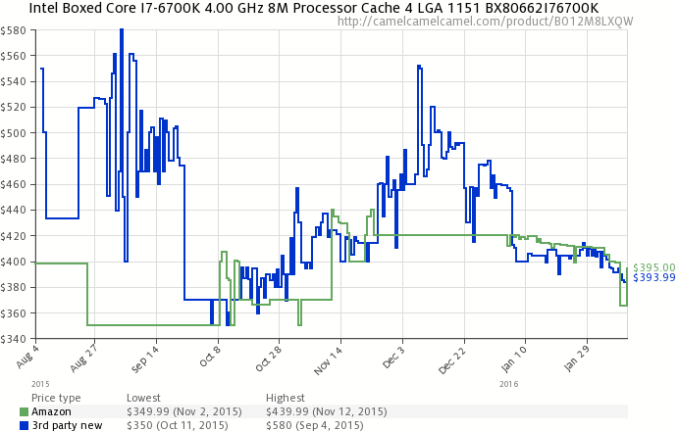 According to CamelCamelCamel, a price-tracker that monitors Amazon and its partners, the Core i7-6700K was available from Amazon for $365 earlier this week, marking a significant shift in price. 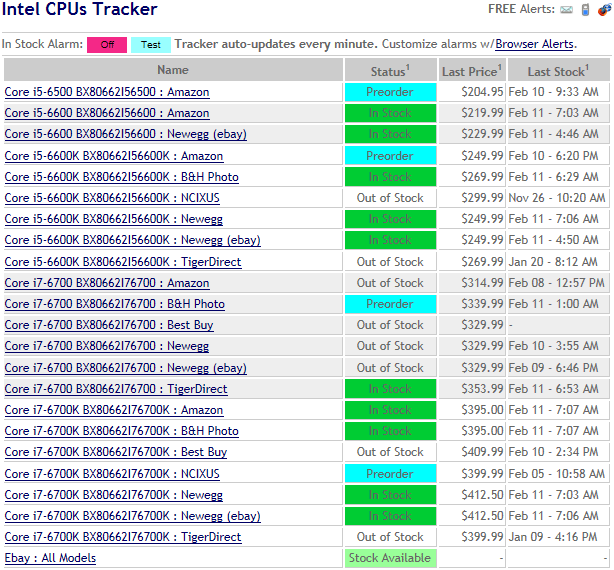 PriceZombie, which monitors Newegg, reports that the CPU is in stock and can be purchased for $412. 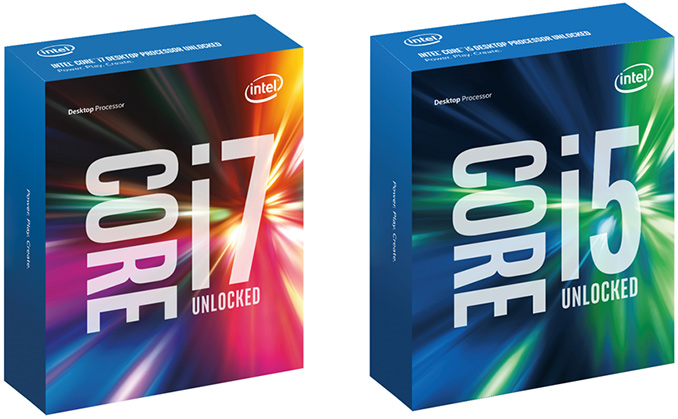 According to NowInStock, the Core i7-6700K is available from multiple retailers but its price remains rather high (e.g., $395 – $412). The Intel Core i5-6600K (four cores, 3.50 GHz/3.90 GHz, 6 MB cache, Intel HD Graphics 530, unlocked multiplier) is another chip in high demand by enthusiasts. 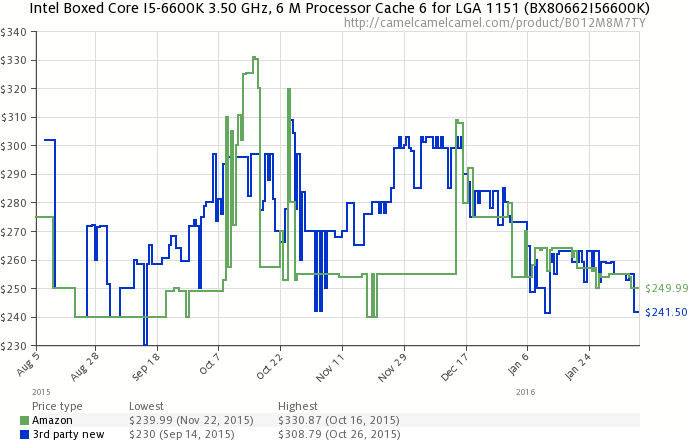 The official price of the boxed version of the CPU is $243, but it was up to $290 in December. At present, both Amazon (CamelCamelCamel) and Newegg (PriceZombie) sell the part for $249 (2/14). Moreover, the Core i5-6600K CPU is readily available from a number of major retailers in the U.S., according to NowInStock. As it appears, the availability of Intel’s Skylake-S microprocessors has improved since December and it is possible to get all the latest chips from Intel. 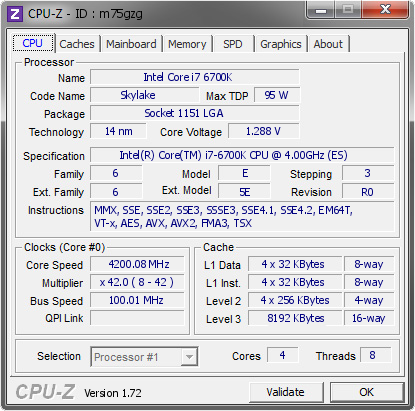 The Core i7-6700K remains overpriced, it is still more expensive than the Core i7-5820K high-end desktop processor (six cores with Hyper-Threading, 3.30GHz/3.60 GHz, 15 MB cache, unlocked multiplier), which can be purchased for $379 – $385 in the U.S. Since the difference between the i7-6700K and the i7-5820K is now miniscule, for many people it makes no sense to invest in a HEDT platform, which involves purchase of an expensive Intel X99 motherboard and at least four memory modules. According to Intel, starting from November, half of its client chips were made using 14 nm fabrication technology, which was a big breakthrough since the latest manufacturing process was a tough nut to crack for the chip giant. Intel had to delay mass production of its 14 nm CPUs from late 2013 to the second half of 2014 due to defect densities. The ramp up of mass production may mean that the defect densities are getting lower. “As of November, 14nm products made up more than 50% of the client computing volume,” said Brian Krzanich, chief executive of Intel, during the Q4 2015 Earnings Conference Call with investors and financial analysts. Starting from the third quarter of fiscal 2015, Intel has been using its Fab 24 manufacturing facility in Leixlip, Ireland, to produce its chips using 14 nm fabrication process. Earlier Intel produced its chips using this technology only in its D1D, D1C and D1X fabs in Hillsboro, Oregon. As Intel ramps up production at Fab 24, shipments of its latest microprocessors are growing. The chip giant does not readily disclose what exactly it produces and where, so it is impossible to say for sure that supply of higher-end Skylake-S models is gradually improving because of the Fab 24 ramp, although given what we do know it seems more than likely. Nonetheless, it is evident that supply of Intel’s unlocked processors has gotten better, just like the share of Broadwell and Skylake CPUs has gotten higher in Intel’s shipments. At present Intel offers various 14 nm chips, including processors for desktops and laptops featuring Broadwell and Skylake micro-architectures, SoCs for tablets and notebooks based on Skylake and Airmont micro-architectures and so on. The company also plans to start shipments of its new Xeon processors featuring Broadwell-EP cores (as well as new Broadwell-E HEDT offerings) in the first half of the year. It is interesting to note that demand for higher-end Core i7 and unlocked processors set a record in fiscal year 2015, according to Intel. Strong demand for CPUs for gamers and overclockers partly explains deficit of Intel’s unlocked Skylake-S chips late last year. “For the year, high-end Core i7 microprocessors and our K SKUs for gaming, both set all-time volume records, leading to our rich product mix,” Mr. Krzanich told investors and analysts. If demand for high-end SKUs is so high, it is not surprising that Intel is allegedly trying to limit overclocking to its Core i7 Extreme (HEDT) as well as Core i7/i5-K product lineups. There is simply no need for the company to enable overclocking for lower-end models if users are eager to buy higher-end parts. Unfortunately, it is also evident that demand for the high-end Core i7-6700K is still high enough to drive the price up at the retailer. 2600k @ 4Ghz + GTX 980 + Samsung 840 Pro here, I don't see any reason to upgrade, yet! I agree. I have 3770K with GTX 980 Ti, 32GB RAM, and Samsung 850 Pro 1TB SSD. As of right now, we will have to wait at least 2 or 3 more years for a worthy upgrade. I am going to wait till the following techs become available. USB 3.0 is available on 6x chipsets. USB 3.1 can be enabled by pcie device, but benefits from it are very small, until you have hardware. There is literatlly a dozen devices with support for full 3.1. PCIe 2.0 isn't that much of a bottleneck. It's a tradeoff - I could drop in newer platform to enable more performance from gpu, but cpu will limit me - find me newer that can do 5.2 GHz.